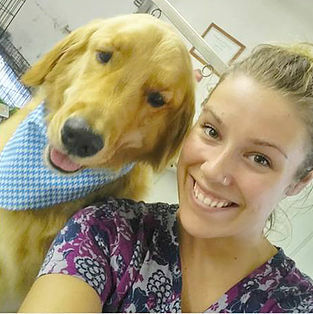 In the spring of 2018, Mia moved to Nova Scotia and began offering her Dog Grooming services at Cornwallis Vets. Originally from Rogersville, NB she moved to Moncton after high school graduation where she took a grooming course at Pretty Pooch Grooming Academy in 2011. She worked as a salon manager at Pet Smart and then worked as a groomer in Mississauga, ON for the past 2 years. Mia’s kind and gentle manner puts her clients and their owners at ease and her love of animals and the joy she gets from making dogs of all sizes and breeds feel great is obvious. Mia currently resides in New Minas with her fur-daughter, Border Collie “Piper” and in her spare time enjoys playing golf and soccer.